New Amsterdam market is growing each year, and the founders hope to make it a permanent part of lower Manhattan. SOUTH STREET SEAPORT — A food fight is brewing in the South Street Seaport. 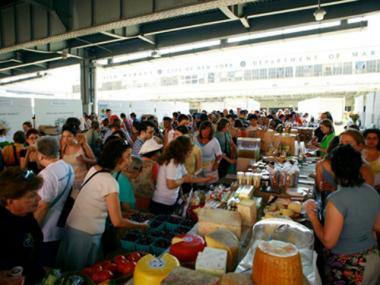 The New Amsterdam Market, which has grown rapidly in popularity since launching its seasonal greenmarket in a parking lot beside the former Fulton Fish Market in 2007, is pitted against the group that has first rights to develop the the warehouse space under the FDR Drive that the market wants to make its permanent home. The market, which features dozens of vendors offering artisanal cheese, locally-made jam, bread with New York-grown grain and other delicacies, draws crowds to its weekly Sunday festivals that typically lasts from April through December. But a grassroots effort by market organizers to move into the abandoned Tin Building and New Market Building has hit a wall with real estate giant Howard Hughes Corp. The company has first rights to develop the city-owned properties after signing a non-binding letter of intent with the city's Economic Development Corporation, according to both sides. After supporters of the New Amsterdam Market started a grassroots campaign to get them a space inside the fish market buildings, Howard Hughes Corp. officials reached out to Robert LaValva, the greenmarket's founder, offering them unsolicited space in the nearby Pizzeria Uno building on Pier 17, LaValva said. But LaValva rejected the offer, saying he won't accept any other space than the historically significant fish market buildings, which he wants to see preserved. "The Fulton Fish Market space is so vital and iconic and important," said LaValva, noting that the site has held a public market for hundreds of years. "[The buildings] are a unique and irreplaceable part of the Seaport district." The company's executives hit back this week, announcing that they would move forward with their plans to create a fresh-foods market at Pier 17 — with or without New Amsterdam Market. "We are now exploring opportunities with other potential operators," Christopher Curry, senior executive vice president of development at Howard Hughes, wrote in a letter to Community Board 1 Monday, "but we do remain open to continuing a conversation with the New Amsterdam Market should Mr. LaValva have a change of heart." Dozens of Downtown residents, vendors and sustainable food advocates turned out to a CB1 meeting Tuesday night to support New Amsterdam Market's vision for the fish market buildings. Supporters say making the market permanent would be an economic boon for the area, as it has already created jobs in the city and helped farmers and purveyors of locally made goods across the region. The idea of a market in the Tin Building and New Market Building has also won support from elected officials including Assembly Speaker Sheldon Silver and State Sen. Daniel Squadron. 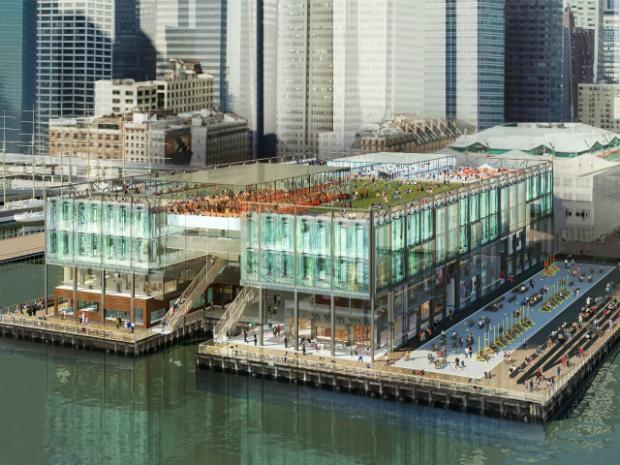 Howard Hughes Corp.'s offer of a public market space is part of the company's larger overhaul of the Pier 17 mall, which won approval from the city Landmarks Preservation Commission on Tuesday. Howard Hughes plans to gut the mall and replace it with a mix of small shops and big-box stores, along with a rooftop lawn and concert hall. The plan does not include the Tin Building or the New Market Building near the base of the pier, which need a lot of work and would be left untouched for now. Howard Hughes and the EDC both declined to comment Wednesday on plans for the historic buildings. "We are working with the New Amsterdam Market on a long-term plan," the EDC said in an email Wednesday. John Fratta, chairman of CB1's Seaport/Civic Center Committee, said at Tuesday night's meeting that he would try to arrange a meeting between New Amsterdam Market, Howard Hughes and the city to come up with an agreement that works for everyone. CB1 has not taken a position on New Amsterdam Market's proposal, but members said they did not want to see any big developments on the Tin Building and New Market Building sites. "This parcel could either make our break our community, and we know that," Fratta said.